Not everyone in the world has a Kindle device. Shocking, but true. So how are these sad and deprived people supposed to download your super special discounted promo ebook? 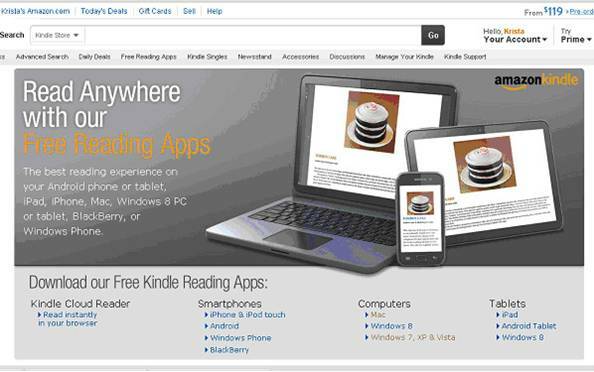 Free Kindle Reading Apps. Yes, FREE! No strings attached. I can vouch for Kindle for PC because I have it on my computer, but there are also versions for Mac, tablets, and smartphones. You don’t even have to know what an “app” is to use it. Every Kindle book page has a teeny tiny link that reads “Available on your PC” or “Available on your Mac” and links to a download page. It takes 2 steps: Click download. Click run. The rest of the installation happens automatically and puts an icon right on your desktop. If you don’t have room to show the above to your readers, you could send them to an alternate page that has links for all of the available platforms. It’s not pretty, but it works. If you lose the URL and haven’t bookmarked this article (shame on you), it can be tricky to navigate to the page. The easiest way I’ve found is to search for something in the Kindle Store, which produces a link at the top for “Free Reading Apps”. However you get there, the alternate page looks like the one below. It provides the opportunity to download a Kindle app on any device: PC, MAC, tablet, smartphone, or the cloud reader if you understand what “the cloud” is. Don’t ask me; I’m scared of it. How to use the app is a topic for another post, but it is fairly straightforward to figure out, and there is also a help link to an Amazon support page that guides users through the basics. Just like with a Kindle device, it’s possible to shop from within the app or to shop on the Amazon web page and have the ebook delivered to the app. Voila, all free. Don’t say I never gave you anything. Now pass it along to your readers. Don’t you love it when we get to take people’s excuses away? 😀 Thanks, Krista! Thanks. This is great for all my family and fans who adore me but don’t know a Kindle from a kitten. One of my twin aunts was one of the first people to buy my book over two years ago and she definitely didn’t have a kindle so she used the free kindle for PC. In fact, I didn’t know about it myself until she told me. So when friends or people ask how they can read my book because they don’t have an ereader, I tell them about the kindle app. Thanks for the reminder, krista. Good post, Krista, and I’m sure there are many newbies to eReading who will find it a helpful stepping stone. I include links for free software eReading downloads on my website.